Pastel colours are very soft and feminine. They appear gentle and calm and can have exactly that effect when used in a floral design. Beautiful pinks, pale blues, soft peaches and fragrant lavenders are perfect for evoking these feelings which makes a Pastel Paradise arrangement an ideal gift for any occasion. When thinking about creating something with pastel colours think about an artist’s palette with a beautiful variety of pale colours. They can be mixed to create different effects and textures. Experiment with the different colours – we know pink and lavender go well together but what about lavender and peach or yellow? Cream and pale pink? Varying shades of baby blue flowers make such perfect partners with other pastel shaded blooms. Remember your colour wheel and think colour harmony. Pastels are perfect grouped together and with the odd deeper shade of the same colour, but be careful mixing them too much with bright colours as these colours can overwhelm the softness of the pastel and make them seen “wishy washy”. And you don’t just have to stick to solely flowers and foliage when creating a pastel design. Because the colours are so delicate why not add a few feathers to create gently movement in your arrangement? Or some beautiful sheer gossamer ribbon? All will add to that feeling or softness and femininity but will also add texture and lightness to it.Pastels can be used in any arrangement. 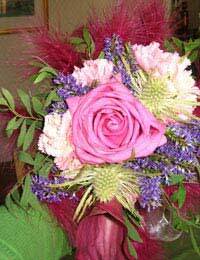 They are perfect for wedding flowers and look stunning in bouquets. They also look muted and respectful in sympathy tributes. A pastel design is perfect gift for any age. This arrangement can be used in a variety of ways – it’s a subtle blend of pinks and lavenders. It is perfect for a young bridesmaid to carry at a wedding or it can be just placed in a vase for a special occasion gift. The choice is yours! This is a wired arrangement so can be time consuming but wiring does allow you the flexibility to move your design around for a perfect effect. On hybrid rose (pale pink); one calla lily (pink); one stem of open spray carnations (pale pink); eryngium (Bluebell variety); pink feathers (about eight); wires; tape; ribbon; eucalyptus; hebe. Create a frill with the feather before tying at the binding point and taping the handle. You can move the flowers around to achieve the effect you are after. Cover the handle with ribbon and add the bow at the binding point.